(11) The first woman speaker of the National Assembly of Pakistan is: . 2. (i) State the importance of Resolution of 1940 in the creation of Pakistan. (ii) Describe the ideology of Pakistan. The creation of Pakistan was unique in the sense that it was based on the ideological commitments in the light of the religion Islam. The term ‘ideology’ means science of ideas. It contains those ideas that a nation strives to accomplish in order to bring stability to its nationhood. Pakistani ideology is based on the ideals of Islamic system and it was a reaction to the Hindu and British “exploitati9n of the Muslims. Pakistani ideology is based on the fact that the Muslims are a separate nation, having their own civilization, their own customs, their own culture, their own religion and a totally different way of life from Hindus. 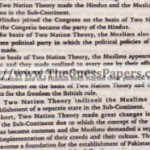 Pakistan ideology” was based on the “Two Nation Theory’, which meant that Muslims and Hindus are two separate nations and both nations are quite different from each other. (iii) Write the importance languages in Pakistan. (iv) What were the causes of the War of Independence 1857? •Exclusion of Indians from important posts. •Landowners deprived of their lands and excessive taxation on them and peasants. •Conversion to Christianity and teaching of it in schools. •Military reforms outraged religious feelings of locals. (v) State the problems faced by Pakistan immediately after its creation. 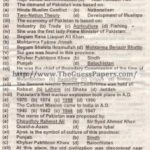 (vi) What are the major imports and exports of Pakistan? According to IMF, Pakistan’s economy is stabilizing however; it remains vulnerable to shocks and is risky for investors. In their analysis on threats to recovery of Pakistani economy. The current political uncertainty which is being fuelled by an overzealous judiciary and an ignorant media is something which we are unable to realize is hampering the economic stability and return to growth. • Pakistan’s CDS (Credit Default Swap) has dropped from 9% to less than 7.5%. it may also be noted that Pakistan has successfully matured its Euro Bond in 2010 and no default has ever taken place. • On the matter of foreign direct itwestment (FOI), they have halved to just $1.77 billion while in comparison a country like Vietnam received more than $10 billion in 2010. • Their report is also cognizant that portfolio investment has improved which means that foreign investors view the capital markets of Pakistan as a better option to invest than going through the FDI. 3. Pakistan is a country rich with cultural heritage. Explain the statement by giving examples from culturally rich regions.